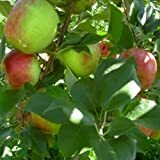 Apple trees for sale – Easy plant to grow with edible fruits, planting in autumn to spring, better to buy grafted tree or another option to start from seeds yet more challenging and plant that not grafted. Growing information: perennial plant, growing hardiness zone: 4-11, water needed – average to big amount, light conditions – full sun to partial shade, height: 2-8 m, 6-24 feet. Blooming in the spring to in bowl shaped flowers that appear in pink and white color. Fruit harvesting in the summer to autumn in oval shaped fruits that appear in yellow-white the color inside, the peel can be in varieties of colors. 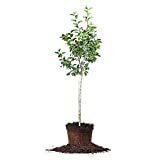 Apple trees for sale – What need to know before buying Apple tree? What is the season to buy Apple tree? Apple trees for sale – need to know before buying Apple tree that require: chilling hours or cool winter (depend on the cultivars), if the tree attack in the beginning of the winter need to collect all the leaves and the fruit from the ground, cut all the infected branches, half to full sun, average to big amount of water, the best season to plant Apple tree it’s in the autumn to early spring.